Wild nature became a source of national pride in the paintings of Bierstadt , as the root of character traits for a unique national identity. This embrace of wilderness released at last a true native creativity in the American mind. No longer bound by classical notions of art and literature in Europe, Bierstadt disregarded European traditions and began to explore the natural world of America for its possibilities of new subject matter.
" 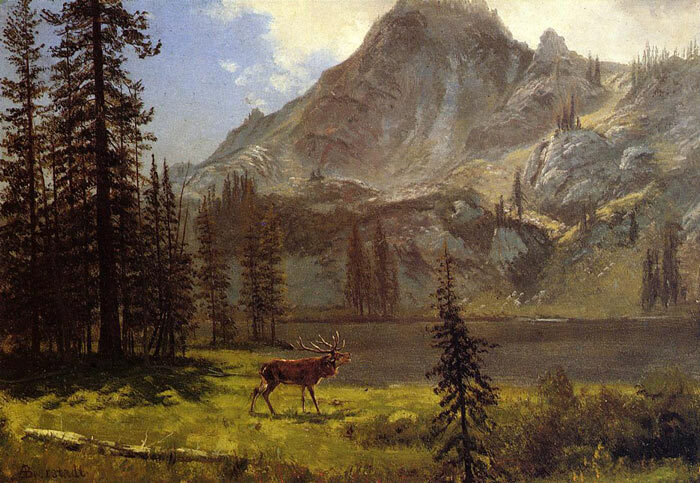 Call of the Wild " by Bierstadt is a typical example of exploring the wild American land. SPECIAL NOTE : The painter will make the reproduction as close to the original oil painting as possible. If you want your painting to alter from this likeness, please email us and " Call of the Wild " will be reproduced according to your special requirements.